Yarlgadda joins Skype from Yahoo where he was VP of Engineering for ICE (Integrated Consumer Experiences), leading engineering efforts for Yahoo’s Home Page, MyYahoo, Buzz, Profiles, ToolBar, Mobile, Maps and Local. Most recentlyhelped unite 35 plys different code bases of Yahoo home page for each of the different countries around the world into a single manageable code base. Yarlagadda, who spent more than 11 years at Yahoo, was also previously VP of Engineering for Yahoo Communities, which includes Messenger, Voice (VoIP), Video, Flickr and Yahoo Groups. 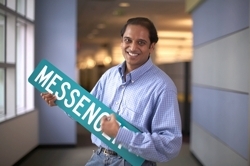 He joined Yahoo in 1999 after his realtime messaging company MyQuest was acquired by Yahoo. Other Yahoo execs who have recently departed the company include EVP Arsh Patel, CTO Ari Balogh, and Search VP Larry Cornett. As for Skype, the company may be looking to add new ideas and leadership to its engineering platform. And Yarlagadda seems to be a seasoned exec, especially on mobile initiatives. And this could be a big year for Skype if the company goes public.